Mounting Magnets – What are they? Mounting Magnets are strong neodymium magnets that are set inside a steel cup or channel. Most come in round shapes, but we also offer a few Rectangular Mounting Magnets. They include countersunk holes or threaded features that allow for mounting with standard hardware (nuts and bolts), as well as various hooks. They are intended to attract to a steel (or other ferromagnetic) surface. Why would I want to use a Mounting Magnet instead of a plain disc or ring magnet? 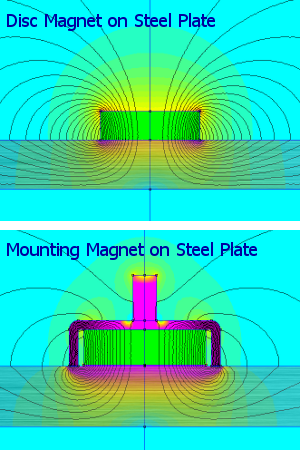 Magnetic field of a disc magnet compared to a Mounting Magnet. Magnet shown in green. 1. More Magnetic Strength. A Mounting Magnet offers much more strength than you get with the magnet alone. If you took the magnet out of a Mounting Magnet, you might only see half the pull force that you had fully assembled. In terms of dollars spent per pound of pull force, they can be a better value than a plain magnet. Why is it stronger? Their construction consists of a disc or ring magnet sitting inside a steel cup. With a plain disc magnet sticking to a steel surface, the magnetic field looks as shown in the top part of the magnetic field picture at left. You get a strong attraction where the magnet touches the steel, but the magnetic field on the opposite side of the magnet isn't doing much to provide pull force. With the steel cup of a mounting magnet, the steel structure redirects the magnetic field from the back-side of the magnet, turning it into more useful holding strength. A Mounting Magnet gets a lot of its strength by the steel cup attracting to the surface, because the steel cup is magnetized by the magnet. In the magnetic field picture, the steel cup looks purple on the color scale because the steel is magnetically saturated -- as full of magnetic flux as it can get. You could say that the Mounting Magnet is stronger because the magnetized steel makes the assembly act like a bigger magnet. Also, you get a lot of strength by having those poles close to one another, which provides a strong magnetic flux in the steel surface it sticks to. 2. Durability. Neodymium magnets are made of a hard, brittle material. If you let them slam into one another or into a steel surface, they can chip or break. Our Mounting Magnets are constructed so that the surface of the magnet is set very slightly below the surface of the steel cup. When it hits a steel surface, the steel cup takes the brunt of most impacts. 3. Mounting Options. 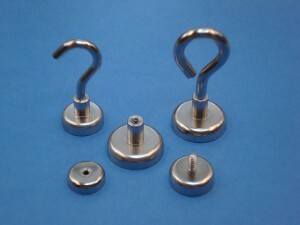 Our Mounting Magnets come in a variety of mounting options. This includes a number of options that include threaded steel features (with male or female threads) that you can attach using standard hardware. Neodymium magnet material is so hard and brittle that you can’t make usable threads with it. We've tried in the past, but the threads shear as soon as torque is applied on a screw or bolt. It is like trying to make usable threads in ceramic. By providing threads in a steel part, you get a sturdy mounting solution not possible with plain magnets. There are also a number of Rectangular Mounting Magnets available, with countersunk holes. How strong are Mounting Magnets? Each of our Mounting Magnets product pages includes a listed Pull Force number, expressed in pounds. This is the force required to pull one of these magnets straight away from a steel surface. Strengths range from just a few pounds, as with the tiny MM-C-10, to several hundred pounds from big 3” diameter magnets like the MMS-A-Z0. Note: When loading the magnets in a different orientation, expect different results. Stuck to a vertical surface like a wall, a mounting magnet won’t necessarily hold up a weight that’s equal to the listed pull force number. In fact, it is usually lower. How much it will hold depends on the friction between the surfaces, the shape of what is being held up, and a few other factors. See How Much Will a Magnet Hold? The magnets with hooks on them are especially worth mentioning in this regard. 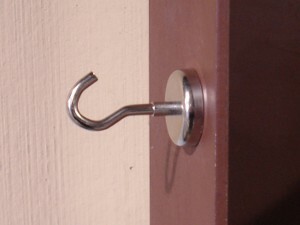 When you hang a weight vertically on one of these hooks, the maximum load is less than the listed pull force. The long hook provides some leverage that makes the magnet easier to pry off when loaded this way. Mounting Magnets are great for trying to retrieve objects that are lost underwater. They are often used to fish up magnetic objects lost on the bottoms of lakes and rivers. 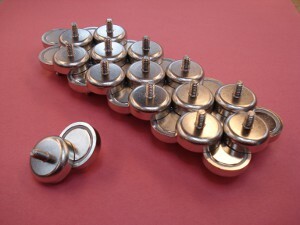 If there is a large steel component to the item, it can be possible to lift with these magnets. 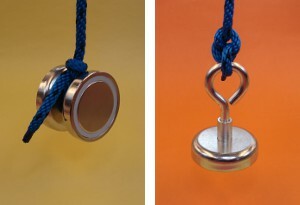 Our MMS-G magnets are popular for this, with their eye-hook that's convenient for attaching a rope or cable. Some of our customers have reported good results using an MMS-C and MMS-D magnet screwed together, with the rope/cable/cord tied on the space between them. The idea is that this combination might be more likely to catch onto an object below the water’s surface. At right, the MM-C-48 and MM-D-48 magnets are shown attached to one another, with the rope tied between them. At far right, a single MMS-G-Y0 hangs from a rope. UPDATE: Check out our recent escapades trying a bit of Magnet Fishing for ourselves! What are Mounting Magnets Not Good For? Magnet-to-Magnet attraction. These magnets are not made for attracting to each other. In fact, they won’t. All of our Mounting Magnets are assembled with the north pole of the magnet facing out. If you try to line them up with one another, they will repel. They will stick together with an offset, as shown. We make them this way for consistency and to make them easier to package together. Sorry, we are not able to offer these magnets with the south pole facing out. Mounting Magnets are not waterproof. If used outdoors, consider some means of protecting them from moisture. Without protection, these magnets can rust over time. A solution can be as simple as a coat of paint. Our Plastic Coated Magnets are a good off-the-shelf solution when protection from water is important. On a scratchable surface. If used on a painted surface, consider MM-RC rubber covers, which are available for many of our metric mounting magnet sizes. These covers were featured in our recent article on Vehicle Signs, where we mounted a big sign on the painted roof of a car. Reaching Across a Distance. Warning: Technical Content. 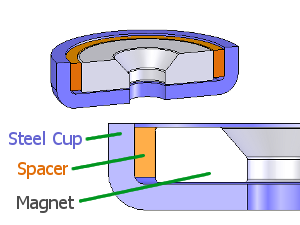 The magnet inside a steel cup construction of a Mounting Magnet offers more strength than a single magnet does when sticking to a steel surface. If there is a significant gap between the Mounting Magnet and the steel surface it sticks to, however, the benefits of the steel cup diminish. The graph of Pull Force vs. Distance below helps to illustrate the idea. 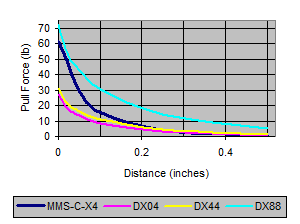 It compares a 1-1/4" diameter MMS-C-X4 magnet to a number of disc magnets: the 1" diameter DX04, the 1-1/4" DX44 and the 1-1/2" DX88. At a distance of zero, where the magnet is touching the steel surface, the Mounting Magnet has much more strength than the similarly sized disc magnets, over double their pull force! If there is a gap of 1/4" or more, however, it isn't much stronger at all. The graph also compares the Mounting Magnet to a larger, 1-1/2" diameter x 1/2" thick DX88 disc magnet. This is a bigger magnet that is more expensive than the MMS-C-X4 mounting magnet. The pull forces when touching a steel surface are very similar, but when there is a large gap, the big disc magnet has the advantage. You can still use mounting magnets with a small gap between the magnet and the steel surface they are attracting to, but be aware of how the strength will decrease with gaps or a layer of non-magnetic material between the magnet and the steel surface. Be careful – they’re strong! As always, be careful when handling strong neodymium magnets. Handle these magnets with care, especially the larger ones. You don’t want to pinch your finger between magnets that can exert hundreds of pounds of force!